The Mrs. Yoy Blog: Lego my kid! Today we took the whole Yoy crew to the newly opened Legoland. Mr. Yoy had taken Big E alone last Saturday and had bragged about how empty it was. This afternoon it was the opposite of empty. It was complete and utter chaos. Please remind me again why I go to any kid-themed place on the weekend? Seriously? Have I lost my damn mind? I was watching Little E as he marveled at the amazing miniature Atlanta built by the folks at Legoland. It is pretty dang cool, if I may say so without sounding like a total geek. Plus everything was at Little E's eye level and he was in heaven. Big E and my mom, dad, Mr. Yoy, two Uncle Yoys, an Aunt Yoy, and cousin Yoy were in the main play area. Just picture ten million Legos, ten million little kids, and every virus known to man. That is the perfect summary of Legoland. Big E had entered the giant playhouse. I was able to drag Little E away from the model of Atlanta to check out what every one else was up to. I walked up to see Big E on the second level of a three level maze. He was stuck in this one compartment. A few older kids tried to help him as they passed by. Big E was like a deer in the headlights. We were all waving and cheering him to move onward. I'm not sure if he could hear us through the plexiglass, but I could understand him. It may have been the panicked look on his little face. Or maybe the fact I could read his lips. HELP ME! HELP ME, MOMMY! HELP ME! My poor little Yoy was stuck. If I didn't do something quick he was going to require years of therapy to help him overcome his fear of indoor playgrounds. After stifling a giggle, or two, because let's all admit that this is sort of funny, I found an employee of Legoland and told him we had a man down. Orange and blue polo shirt. About three feet tall. Blinded by fear. The employee pointed to Big E. I confirmed. Yep, that's my kid. The employee then graciously snaked his oversized body through the playground and counseled Big E out of his little compartment of fear. Big E then disappeared into the remainder of the maze. I wondered if we'd seen the last of Big E.
About a minute or so later, I spotted him running towards the exit. And just like that he was safe and sound and back in my arms. 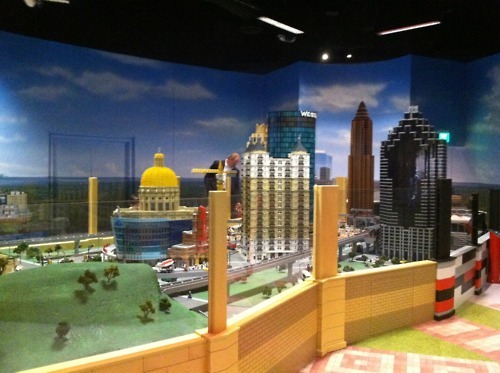 A Lego replica of the ATL. The building in the middle is where Mr. Yoy and I met and the story of the Yoys began.